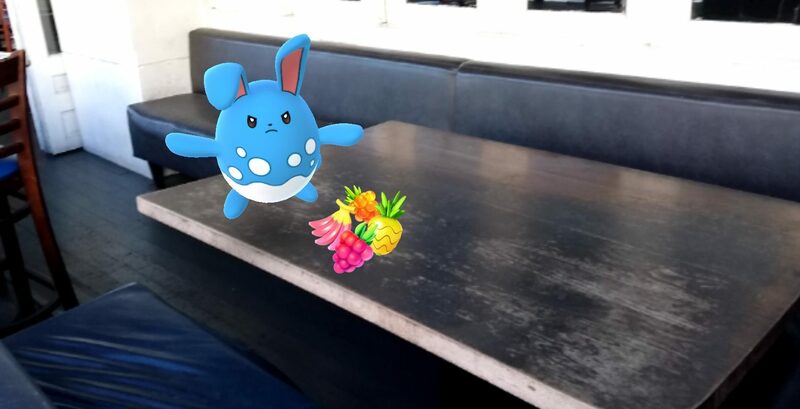 So, you’re in Pokemon Go, and you just saw a Pokemon. You clicked the little beast and now are in the catch screen. Just straight flick those balls at the Pokemon and hope for the best, right? Wrong! I mean, you can do that, but with very little training, you can throw curveballs, drastically increasing your capture rates, allowing you to complete special quests/tasks. When you combine your new technique with new items to get more candy/dust for your effort, you’ll be amassing an army of digital beasties in no time! Especially for those of you played in the very early days in America, Pokemon catching has changed. The “step” system is gone. Instead, Pokemon are often by PokeStops. You can click on the bottom right of the screen to see nearby Pokemon, click the one you want to track, and the game will highlight the area you should search for it. Pokemon with a grass icon can be, well, just about anywhere not near a Stop. How the latest tracker works. Click to zoom in. However, it’s important to note that Pokemon spawn like any MOB in your favorite MMO. Once you know the spawn nodes, you should have an idea where to look for your Poke-prey. These locations rarely shift, and others may be added for events, though Pokemon migrate every so often. That means if you see a lot of Bulbasaur at the local park (we call this a nest), they will move after a certain amount of time. Don’t worry, as the game will send an announcement of when this happens. Catching Pokemon isn’t just about flicking balls. The shrinking circle outside the Pokemon is a target, and landing the ball inside a smaller circles makes it easier to catch. You also have several levels of Pokeballs to use, with the normal red and white being the weakest and the black and yellow being the strongest, once you’ve unlocked them at level 20. You also now have several kinds of “berries” to help you. Razz berries (pink) make Pokemon less resistant to being caught, so use them on stubborn (and rare) Pokemon you don’t want to lose. Once you do raids, you’ll build up a supply of Golden Razzes (orange), which are the same but on steroids. Nanabs (pink bananas) make a Pokemon less likely to attack or dodge, which are tricks to avoid your throws. Except for quests, I generally only use nanabs for gyms (more on that later). 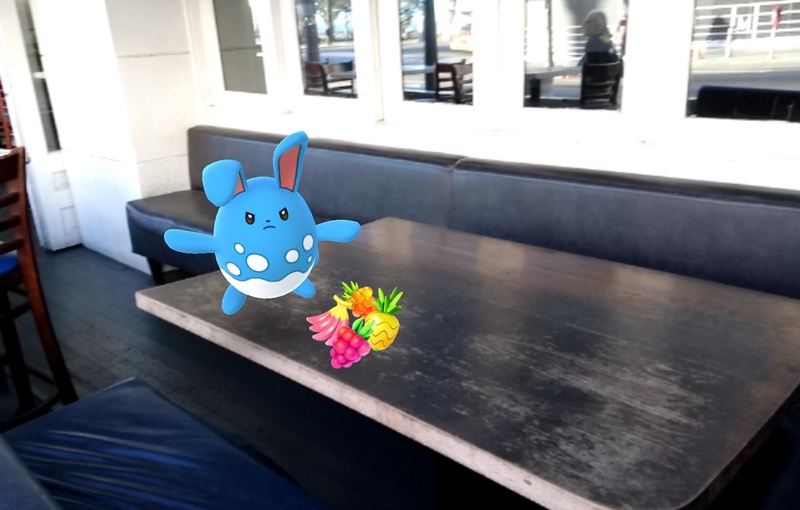 Pinaps (pineapples) give you double candy rewards, so use them on low CP rares (or anything you’re willing to gamble on). The throw is the trickiest part. I still meet people who have played for two years that struggle with the curveball, which is the throw needed to best increase the likelihood of capturing your target. For the most part, don’t do a straight throw. Simply spin the ball and release it while bringing your finger up from the curve. Confusing? Yeah, so let’s actually show it in action. The video is a bit long, but you don’t need to finish it or listen to it all. What I like about it is that it has touch-tracing on so you can see how the ball is thrown, and that’s viewable within seconds. You can spin the ball the ball differently (I actually throw the opposite way, though I’m nowhere near at consistent), but just seeing the motion should help give you an idea of how the curveball is pulled off. Not only does it make catching easier, but it grants more experience and is required for some of the more rewarding quests. You’re going to mess up. Don’t worry about it. This is a critical technique that vastly ups your catching game. I’ve had middle-aged moms train to do it themselves, as well as coaching people how to pull it off. If you find another player who’s able to pull it off well, ask them to watch your throw and give some advice. There is a more advanced method to help ensure catches, but I’ll just leave this here for those of you looking for extra credit. A solid curveball alone will up your catching game significantly, but if you can nail consistent excellent throws (the smallest, say, 10% of the circle’s size) and use the circle locking trick in the above link, less skilled trainers in your group will always want you around to help them with their catches. To note, it isn’t uncommon for people to offer to throw for you. If you know the player or are in the same group, I’d assume you’d be safe, but use your best judgement. Also, remember that letting other people throw for you means you’re not getting better yourself. If you’re really worried about losing a really good Pokemon, it may be worth the risk, though catching it yourself naturally feels pretty good. Hopefully by winter i’ll have a smartphone again (i have dumbphone now), this game may give me another reason to walk more, thanks for the tips.